Joan Jackson and her husband, Lawrence, have lived a mile and half from the Chemours Fayetteville Works plant for about 40 years. They’ve relied on a 70-foot well for their water — water that hasn’t felt right for some time. Although state tests showed the Jacksons’ well tested below the health advisory goal for GenX and older fluorinated compounds, PFOA and PFAS, there is something amiss, Joan Jackson said. “We’ve heard other people say their water feels different,” replied Michael Scott, director of the state Division of Waste Management. And when granulated activated carbon filters have been placed on their wells, Scott added, residents have reported the water felt normal again. Stories like these, as well as new scientific information about fluorinated compounds, have prompted state and federal officials to broaden to the scope of potential health effects from this family of chemicals. The EPA underscored that point at a national summit last week, said Assistant DEQ Secretary Sheila Holman, among state officials who attended the event. “It’s not advisable to solely evaluate compounds one at a time, but cumulatively,” Holman said. This federal recommendation echoes what scientists, including NC State University professor Detlef Knappe and UNC Wilmington professor Larry Cahoon, have long been advising. 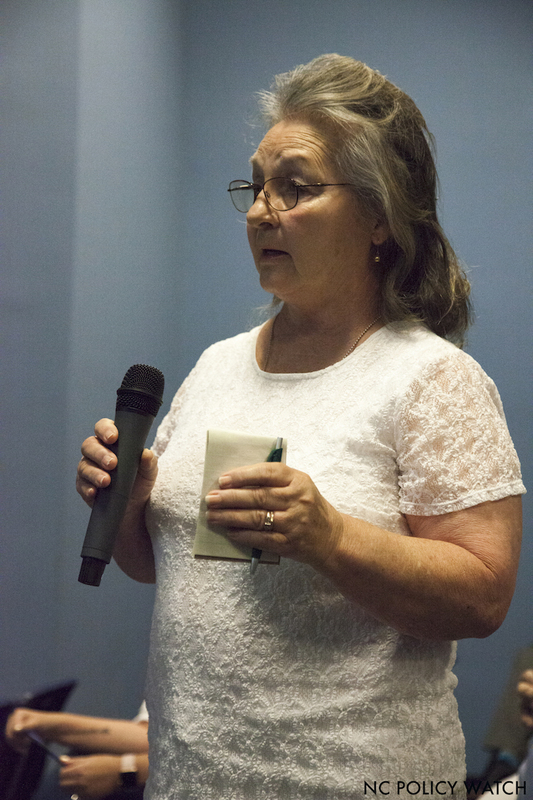 Last summer, Cahoon spoke at several public events about the “toxic cocktail” of fluorinated compounds in the Cape Fear. Knappe co-discovered GenX in the Cape Fear River and in Wilmington’s drinking water supply. He and other members of the state’s Science Advisory Board have also discussed the problem of how fluorinated compounds behave when mixed, since several of the legacy contaminants, such as C8, can cause cancer. The state has set a provisional health goal of 140 parts per trillion for GenX in drinking water. The EPA has established a provisional health goal of 70 parts per trillion for the combination of PFOA and PFAS in drinking water. Neither goal is legally enforceable. The state Science Advisory Board could recommend “tweaks” to the GenX provisional health goal as early as its June 18 meeting, Holman said. In addition, Scott said the state plans to ask Chemours to retest wells that previously showed levels of GenX between 100 and 139 ppt. Lawrence Jackson, husband of Joan, demonstrates to state environmental officials about how family towels don’t seem to absorb water. The Jackson’s well tested below the state’s health goal for three fluorinated compounds. It’s hard to draw a conclusion without further testing, but these compounds are used in waterproof materials, such as Gore-Tex. Meanwhile, Scott of the Division of Waste Management said the state has begun testing a limited number of wells for other compounds. Chemours is conducting the bulk of the testing, though, with the state checking the company’s work. St. Pauls, in Robeson County, lies about 25 miles south of the Chemours facility. But even that far away, GenX, PFOA and PFOS have been detected in drinking water wells. The Robeson County health department tested 39 drinking water wells — 36 private and three of them owned by the county. Thirty-five contained GenX, albeit below the provisional health goal. Four were non-detect. One well, though, tested above the goal for GenX, at 232 ppt. Another sample, showed 1,500 ppt for the combination of PFOA and PFOS, far above the EPA’s recommendation of 70 ppt. These compounds are likely traveling through the air, which transports the chemicals far from their source. The state is requiring Chemours to reduce and eventually eliminate, emissions of fluorinated compounds from its stacks. The company plans to install carbon beds, which could reduce emissions by 40 percent. Updated scrubbers could remove the chemicals by up to 70 percent. And by late 2019 or early 2020, Chemours is scheduled to install thermal oxiders, which could reduce the contamination by 99 percent. These oxiders destroy the compounds by intense heat, upward of 1,000 degrees Fahrenheit. That time frame is still too long for residents who rely on bottled water for cooking and drinking. Scott said state officials have told Chemours they “want a plan for permanent water lines” to be extended — and paid for by the company — to affected well owners. Granulated active carbon filters, installed at the well, have so far proven effective at removing GenX. This pilot project is still in early stages, with just six wells in the trial. Chemours has begun excavating contaminated soil from near its Fayetteville Works plant, a measure that could help stem the flow of GenX and other fluorinated compounds from seeping into the groundwater. Levels of GenX have been measured as high as 61,000 parts per trillion in groundwater below the plant. The company is also pumping groundwater — 6,500 gallons so far — from an area known as the “perched zone” of the aquifer. A perched zone lies above the water table. Pumping contaminated groundwater from that zone could reduce the amount of pollutant entering the aquifer, which then carries it to private wells. The EPA will visit North Carolina in late July or early August for a community meeting about PFOA, PFAS, GenX and other fluorinated compounds. he location hasn’t been determined, Holman said, but it will likely be somewhere near the Chemours facility, which is near the Cumberland/Bladen county line. Less than 24 hours before the meeting in Robeson County, Republican state lawmakers had released their 2018–2019 budget, which the public, nor their Democratic colleagues had seen nor been given the opportunity to comment on. 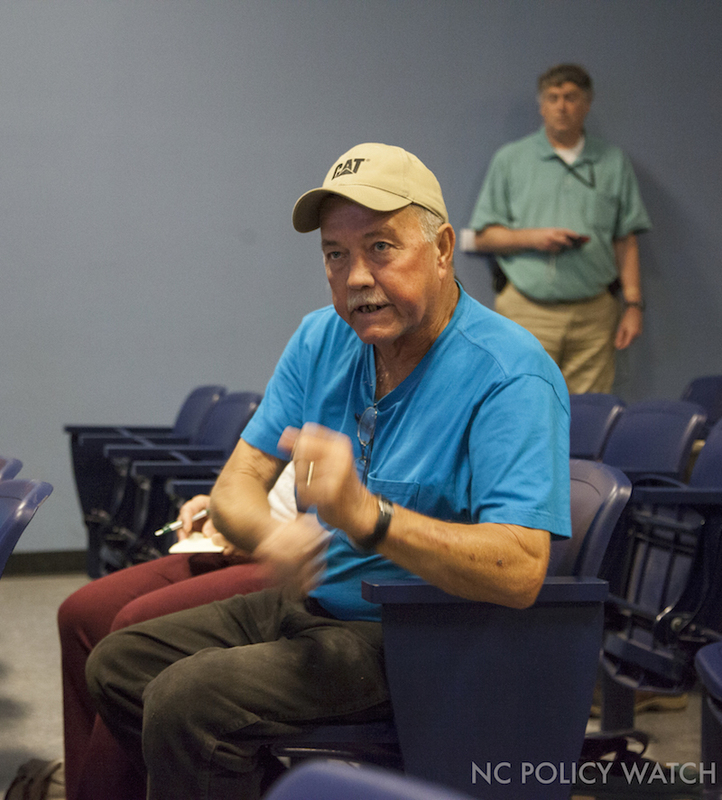 None of the lawmakers who crafted the DEQ portion of the budget — enshrined in the euphemistically named Water Safety Act — attended the meeting in Robeson County. In fact, only two state lawmakers attended the meeting: Republicans Sen. Danny Britt Jr., whose district includes Robeson County, and Rep. Susan Martin of Wilson and Pitt counties. Martin was a secondary sponsor of the Water Safety Act. She is not running for re-election. The inaction by Republican lawmakers prompted Bladen County resident Tommy Budd to change parties. “I was a Republican, but I changed to unaffiliated,” said Budd, who lives in a neighborhood near Camp Dixie, which also tested positive for GenX. “I’m going to vote for people who will do something for me,” Budd said. Meanwhile, Scott told the Jacksons the state would try to resample their well, or at the very least recommend a private company that can do it — although that can cost upward of $300 per sample. “We’re not able to test all the wells whose owners have requested it,” Scott said. Why? There isn’t enough staff or money. Nevertheless, our Secretary of DHHS, Mandy Cohen, did not incorporate the cancer effects when she developed the “safe” level of 140 ppt. Why not? Lest we forget, Cooper’s DEQ administration claimed Chemours was blameless for all of this in the beginning. Why?